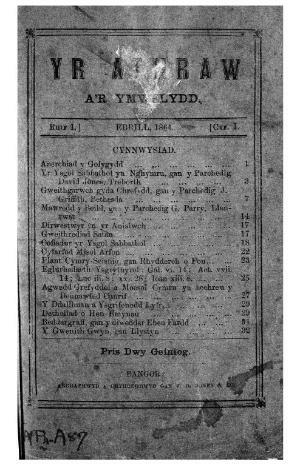 A monthly Welsh language religious periodical that was intended for the Sunday schools of the Calvinist Methodists. The periodical's main contents were religious articles and lessons for the Sunday schools, alongside poetry. The periodical was edited by the author, hymnologist and musician Morris Davies (1796-1876). Publisher Details: J. D. Jones & Co.